We all know we’re supposed to ignore our smartphones while driving. Yet somehow it’s OK to take our eyes off the road to glance at some kind of GPS unit? Navdy is one of the first GPS devices that claims to be safer for drivers by putting the map and other info front and centre so your eyes stay on the road—it’s also one of the most comprehensive in-car navigation devices on the market. First revealed way back in 2014, the £600 Navdy’s approach to reducing distracted driving isn’t just about putting a translucent screen right in front of a driver—if that’s all you need, Garmin’s £100-odd HUD has you covered. It also vastly improves and simplifies the clumsy and confusing interfaces that have plagued GPS devices since they first showed up in cars. And because some drivers simply can’t ignore their phones, even for just 10 minutes while you drive to the store, Navdy puts all your phone notifications on the screen alongside the map. Installing the Navdy hardware isn’t as easy as installing a touchscreen GPS device that simply suction cups to the windshield. It’s crucial to perfectly position the Navdy display unit on the dashboard, which requires some frustrating trial and error. 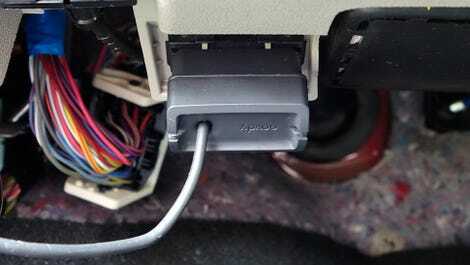 You’ll need access to your car’s ODB-II port to install the Navdy hardware. If it’s not easily accessible, installation will be difficult. The first step to installing Navdy is connecting it to your car’s (in my case, a Dodge Grand Caravan) ODB-II port. Usually found underneath the dashboard, mechanics use this port to quickly diagnose problems, and nearly every car made in the last 20 years has one. Mine was completely exposed and easy to get to, but it could be harder to located on other cars, so it’s a good idea to hunt for yours first. This unsightly wire running across your dashboard is definitely one of the downsides of installing Navdy. In addition to giving it access to vehicle data like speed and gas usage, the ODB-II port also powers the Navdy hardware. The downside to that is you’ll have to learn to live with a wire running across your dashboard at all times. The installation kit includes a series of clips that ensure the wire stays out of the way, but Navdy will always look like an aftermarket upgrade unless you’re willing to pull up panels and properly hide the wires. It took me about 20 minutes to position (and re-position, repeatedly) everything perfectly, as the installation instructions require the Navdy’s UI to appear as if it’s floating just above where your vehicle’s hood meets the road. When you’re sitting behind the wheel, the Navdy’s map and UI fills its entire, six-inch wide see-through display. Once the hassle of installation is done, you’re left with a useful display that’s so subtle it’s actually hard to photograph. The roughly 6-inch clear plastic panel reflects a high-contrast image from a tiny projector that’s reminiscent of the futuristic helmet HUDs that fighter pilots rely on. It automatically adjusts its brightness based on the ambient lighting in and around your car, so even when you’re staring at a bright sunlit road ahead, the UI never gets washed out. Navdy is reminiscent of old-school TVs which bounced an image onto a larger screen using a projector. Because the Navdy uses a tiny projector, you will still see those weird colour shifts when you look away and quickly move your eyes across the screen, which can be annoying. 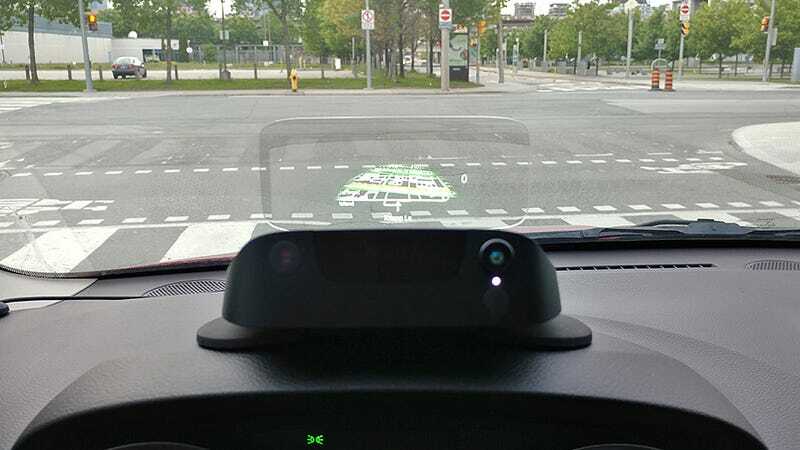 The Navdy screen also has a very specific viewing angle, so once the hardware is aligned and installed on your dashboard, you’re not going to want to drastically adjust the angle or height of the driver’s seat, or shift around too much while you drive. In addition to a live map, Navdy can also display a customisable dashboard so you can monitor your speed without having to look down. The Navdy hardware shows your current position at all times using built-in GPS and offline map data sourced from HERE, but it can also switch to a virtual dashboard that can be customised with important details like your current speed and gas level. Some functionality you’ll normally find in a GPS device is passed off to the Navdy app to help simplify its user interface. 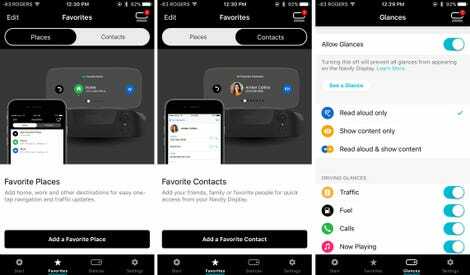 But to take full advantage of Navdy’s features, you need to wirelessly connect it to your phone. This adds turn-by-turn directions and traffic data (via Google Maps), the ability to control and play music, access to customisation notifications, and even the ability to trigger your phone’s smart assistant. Navdy includes a scroll wheel that straps to your steering wheel, making it easy to navigate the user interface without having to look away. A smartphone might be essential to accessing Navdy’s best features, but the hardware also manages to stay relatively hands-free. 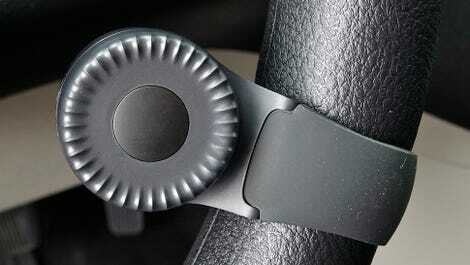 A small scroll wheel with a centre button easily attaches to your steering wheel for quick navigation. 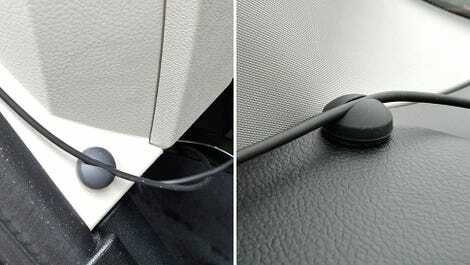 Powered by a coin battery, it wirelessly connects to Navdy and is intuitive to use—though having it always attached to your steering wheel takes some getting used to (I kept hitting it with my fingers while making turns). A camera on Navdy, constantly staring back at you, lets the hardware recognise simple hand gestures for dismissing notifications. You can also navigate Navdy’s UI with simple hand gestures. A camera on the front of the device can detect when you’re waving your hand in front of it, letting you quickly dismiss or read notifications. It’s a great concept, but unfortunately, it was a little hit and miss during my testing. I often had to place my hand close to the camera and wave very deliberately for the gestures to be detected, which kind of defeats the purpose of a hands-free feature. You’ll want to give yourself some time to get used to Navdy’s floating display, as it can itself be a distraction at first. Unless you’re a fighter pilot who’s used to having a HUD in your face all day, Navdy’s unique see-through screen takes some getting used to. 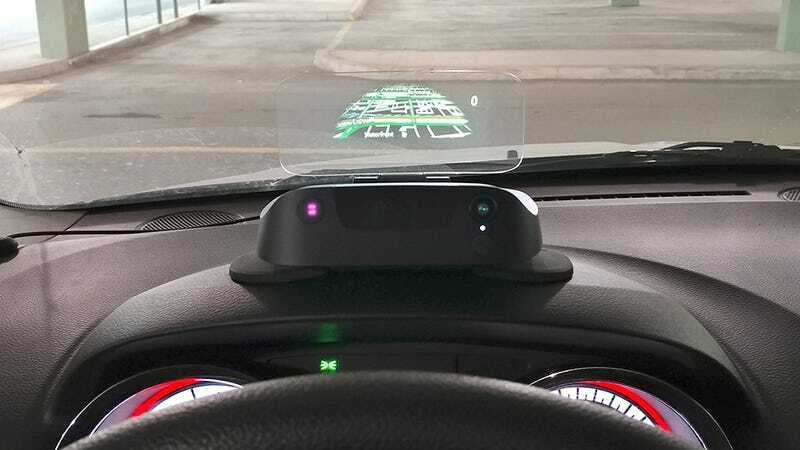 Eventually you’ll learn to occasionally glance down at it for directions, or to check your speed, but during the first week of testing I found myself constantly looking down at Navdy’s novel floating display, and that took my eyes off the road ahead. Did I crash the car? No. But the whole point of the Navdy is to help reduce distracted driving, and it only does that after the novelty has worn off. Do you need to spend £600 on a hands-free navigation device when more traditional touchscreen GPS units can be had for around £100? If you only occasionally have a need for a dedicated sat-nav, like while travelling, you’ll be just fine with a cheaper Garmin. But if you rely on your navigation device every day, Navdy provides an all-around better experience. Most sat-nav UIs are notoriously archaic, but the Navdy app and software are extremely polished with frequent updates, and having Google Maps’ traffic data on-screen at all times turned out to be a feature I can no longer live without. 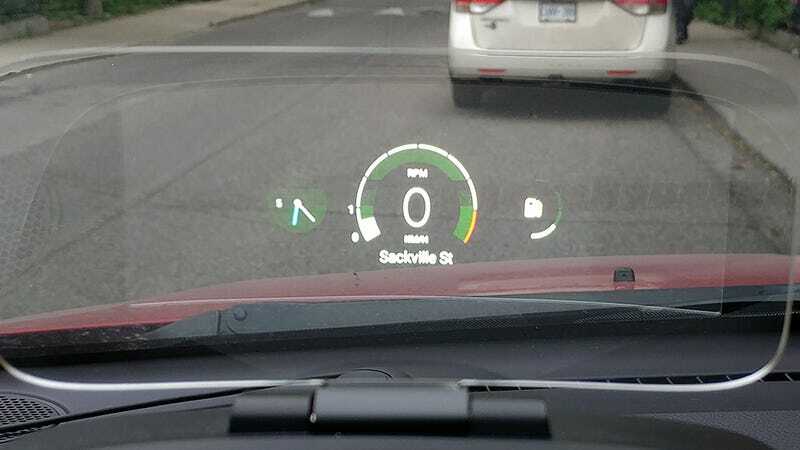 And if you want to live out your Top Gun fighter pilot fantasies on your drive to and from work every day, Navdy’s always visible dashboard-mounted display will save you from having to enlist in the Navy. The first GPS navigation device that genuinely lets you keep your eyes on the road at all times (and feel like a fighter pilot). But you will have to train yourself not to stare at it all the time. Installation isn’t complicated, but it is time-consuming. And once installed it will always look like an aftermarket upgrade. To access Navdy’s best features you’ll need to use it with a smartphone and an app. Using the steering wheel scroll wheel to navigate Navdy’s streamlined UI is very intuitive and natural. Some common navigation functions are only accessible via the Navdy app, making them inaccessible while driving. Map data is updated on a quarterly basis every year, and you can swap in offline maps for other areas of the world as needed. 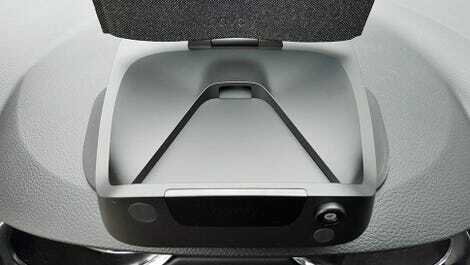 At £600, it’s one of the most expensive GPS devices you can buy for a car.